Hello and greeting all readers. I cant sleep early tonight so I decided to write an entry. But I still wonder why I got lots of ideas to write when its not on the right time like at work and etc etc..haha Maybe at that time my brain work at top gear.LOL..By the way this time I'm going to talk about the road not taken. Sometimes in our life we do encounter this situation whether its in making decision over one or many option or really just to choose between the road in map.LOL..I personally have encounter this kind of situation and I bet everyone else too. Sometimes its just hard to make a decision. Lots of things need to be calculated and lots of feelings need to be consider. 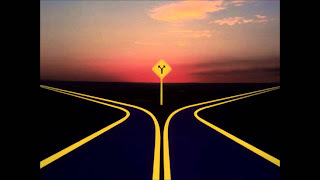 Two roads,which one will you choose? We usually tend to choose the most safest option and the one that people usually tend to choose for example you just graduated from high school anf got 2 offered from different university on 2 different courses. One is Medic and the other is in Business Management..Of course being a sane person we would say that choosing Medic is a right choice because well, being in medic field is quite respectable and got high income and easy to get a job. So choosing Medic course is the road that people usually take and choosing Business Management is the road not taken because well you know the reason.LOL..
So,whatever decision we make remember to think carefully. Somethings thats good for others doesnt mean it is good for us. Different people fit different shoes. REMEMBER that. I thinks thats all for now..